DY-SPT-I/II Self-Propelled Thermoplastic Road Marking Machine is a kind of self-propelled thermoplastic road marking machine. It can mark straight and beautiful road line, and is the best choice for small sized urban road line marking. 1. A firm welded frame is made of hard aluminum alloy, road marking machines manufacturer with corrosion and heat resistance, after high speed imported, the whole machine Road Marking Equipment for Sale more lightsome and convenient. 3. The automatic quantitative glass beads dispenser synchronous with the Thermoplastic machine paint screeding system ensure the spray of glass beads more even and economical. 4. 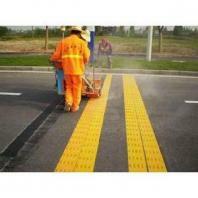 Advanced scraping apply structure can mark the thermoplastic road marking equipment line straight and beautiful. 6. Rear wheel directional device can ensure the hand-push thermoplastic machine road-marking machine moving in straight lines and turning freely on incurved road. Our company is specialized exporter, manufacturer and supplier of Self-Propelled Thermoplastic Road Marking Machine in China. Address: No.18, Dongming Road, Jinshui District, Zhengzhou, Henan, China.